Animal organs. Cardiovascular system. Atlas of plant and animal histology. The circulatory system consists of the cardiovascular system and lymphatic system. Cardiovascular system conducts blood and is composed of arteries, veins, capillary nets, and the heart. Lymphatic system is constituted by more heterogeneous structures like lymphatic vessels, lymphatic ganglia, nodules, and by organs like spleen and thymus. The cardiovascular system is the main system for communication between different parts of the body of animals. It pumps and conducts the blood to irrigate the every part of the body. Blood is necessary for transporting food, waste products, oxygen, carbon dioxide, hormones and immune system cells. It also has other functions like keeping a constant body temperature. The cardiovascular system is a double circuit, one irrigating the lungs, and the other irrigating the rest of the body. Both start and end in the heart, which is the organ in charge of keeping the blood in permanent motion. The pattern of blood vessels is the same in the two circuits: heart, arteries, arterioles, capillary net, small veins, veins and heart again. Sometimes, arterioles or small veins may be found connecting two capillary nets. 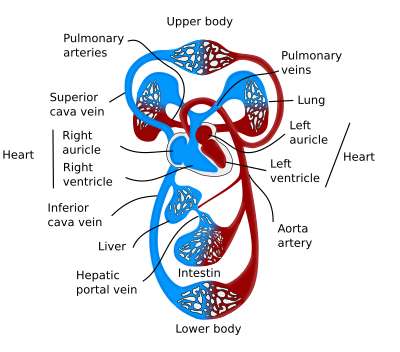 This is a portal system, like the hepatic portal system that include the intestine and liver. Arteries and veins are made up of three layers or tunics: tunica intima, tunica media and tunica adventitia. The tunica intima is the internal one, in contact with the blood, and it is constituted of a squamous simple epithelium (endothelium), a basal lamina, and a layer of loose connective tissue. The tunica media is mainly composed of smooth muscle cells. The tunica adventitia is the most external one and is connective tissue. Arteries and arterioles show thicker walls that veins and small veins, respectively, to resist stronger blood pressures because they are closer to the heart. Arteries usually have smaller diameter that veins that, together with their thicker walls, make them more rounded in histological sections, whereas veins show more irregular shapes. Arteries and large veins contain other small blood vessels irrigating their walls, which are known as " vasa vasorum" (vessels of the vessels). This net of internal vessels is located closer to the tunica adventitia in arteries and closer to the lumen in veins. Arteries are more easily damaged that veins during pathological processes because the part of the tunica media (is mostly smooth muscle) close to the lumen is less irrigated. In the wall of arteries and veins there are nerve endings that modulate de contraction strength of the smooth muscle. Layers or tunics in a vein (on the left) and in an artery (on the right). Both are medium size vessels. Note the different thickness of the tunica media between the two vessels. Arteries are vessels conducting the blood in the heart-organ direction. The walls of arteries are thick to withstand the blood pressured produced by heart beating. According to the diameter, arteries are usually classified in large or elastic, medium or muscle and small or arterioles. Blood leaves the heart by the aorta and pulmonary arteries. Both get branched near the heart. These arteries and their first branches are regarded as elastic arteries. Their walls contain a large amount of the elastic fibers that make them recover a normal diameter after an enlargement produced by a heart beat. Elastic arteries show a thick tunica intima. The endothelium is made up of cells having tight junctions and desmosomes that keep cells well attached to each other. The major axis of the cells is oriented parallel to the direction of the blood flux. Subendothelial layer is connective tissue with collagen and elastic fibers, and some smooth muscle cells. The elastic lamina, which separates tunica intima from tunica media, is thin and sometime difficult to be observed. The tunica media is very thick, mostly made up of elastic and collagen fibers and many smooth muscle cells. The tunica adventitia es a layer of connective tissue with fibroblasts. Here there are not smooth muscle fibers. It is of notice that smooth muscle fibers of elastic arteries, besides of being responsible for the artery diameter by cell contraction, synthesize and release elastic and collagen fibers, i.e. they take the role of producing extracellular matrix. Muscular arteries are medium size arteries, with varible diameters, and their histological organization is a transition between the elastic arteries and arterioles. The size of muscular arteries ranges from 0,1 to 10 mm in diameter. So that larger muscular arteries are more similar to elastic arteries and the smaller ones are more like arterioles. Proportionally, they contain less elastic fibers and more smooth muscle cells than elastic arteries. The diameter of small arteries and arterioles is variable, and they are identified by the number of layers of smooth muscle cells. As a consensus, small arteries show from 2 to 8 layers of smooth muscle. Arterioles have 1 to 2 layers and their diameter is about 30 μm. Arterioles are the main responsible for controlling the flow of blood that enters the capillary net by contracting their smooth muscle cells. Actually, these muscle cells are usually slightly contracted so they can regulate precisely the stream of blood. Both small arteries and arterioles have the same three tunics that are found in other arteries. Capillaries are the smallest blood vessels, sometimes even smaller than a red blood cell. The interchange of gases and substances between blood and tissues occurs mainly through the capillary endothelium. Capillary walls are made up by the endothelium and a basal lamina, and lack any other layer, so that the gases and substances interchange is facilitated. Capillaries are organized in widely distributed nets that irrigated all the organs of the body. This type or irrigation is known as perfusion. Endothelium can be continuous, fenestrated and discontinuous according to their cellular features and organization. Continuous endothelium is the more abundant capillary type. The endothelial cells seal the intercellular spaces so tightly that only the smallest molecules can cross the endothelium through the intercellular spaces. 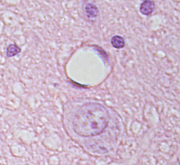 These endothelial cells show many cytoplasmic vesicles that indicate strong endocytocis and exocytosis processes. Fenestrated endothelium shows endothelial cells with channels or passages that connect directly blood with basal lamina and inner tissues. They are frequent in endocrine glands and intestine, places where the flux of substances to the blood is very intense. Discontinuous or sinusoidal endothelium is less frequent. Its endothelial cells do not completely seal the intercelular spaces, so that substances and even cells can cross freely the endothelium. It is found in the liver, bone marrow and spleen. Veins show the same structural organization as arteries. However, veins usually have larger diameters and the tunica media is not so well-developed. In addition, many veins, particularly those in the limbs, contain valves in the lumen preventing blood going in the wrong direction, that may be caused by gravity or by mechanical pressures. Veins are classified according to their size: large, medium, and small veins or venules. Large veins have a diameter of about 10 mm. Their tunica intima is formed of endothelium, scarce subendothelial tissue and few smooth muscle cells. The differences between tunica intima and tunica media are not easyly distinguished. The tunica media is thin with smooth muscle fibers perpendicularly arranged to the long axis of the vessel. The tunica adventitia, the thicker layer of the large veins, is made up of connective tissue and muscle fibers longitudinally arranged. These veins are smaller (about 10 mm in diameter) than larger veins and account for most of the veins of the organism. The shape of the medium-sized veins is more irregular that arteries and the three tunicae can be observed. The tunica intima shows endothelium, basal lamina and a thin layer of connective tissue containing some smooth muscle cells. Sometimes, an internal elastic membrane can be distinguished. 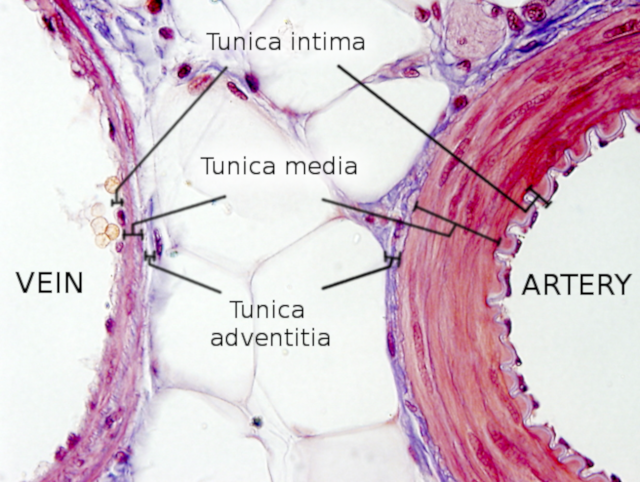 The tunica media, although thinner than in the larger arteries, show several layers of smooth muscle cells scattered among connective tissue. The tunica adventitia, which is formed by connective tissue, is thicker than the tunica media. There are two types of venules: postcapillary and muscular. Postcapillary veins receive the blood directly from capillaries. They have a very small diameter (about 0,1 mm). Influenced by molecular signals, the adhesion properties of the endothelial cells change frequently, which allow linphocytes and blood serum to easily cross the endothelial layer. These venules do not show a "true" tunica media. Muscular venules, about 1 mm in diameter, are located after the poscapillary venules. They have a tunica media with one or two layers of smooth muscle cells. They also show a thin tunica adventitia. Organization of vein tunicae in veins with different diameter. Vein valves are not depicted. Image showing a vein valve located in the transition between two veins of different diameter. B and C images are details of image A. The direction of the blood flow is from the left toward the right. The heart is the organ that pumps the blood through the circulatory system, helped by the body movement. It is mostly made up of cardiac muscle cells, which are found only in this organ. The mammal heart has four chambers, two ventricles to pump the blood, and two auricles, one that gathers the pulmonary blood and the other collects the blood from the rest of the body. 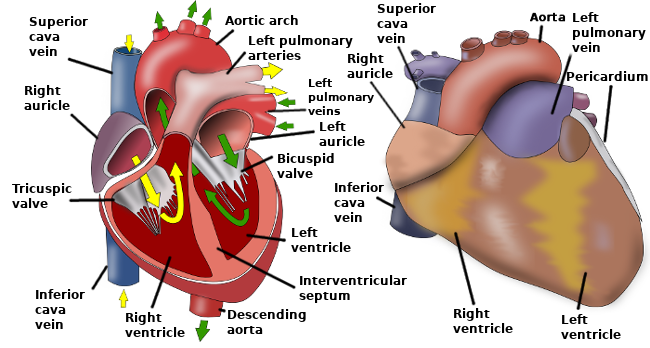 The two auricles are separated by the interventricular septum and the two ventricles by the ventricular septum. In each of the auricle entrances there is a valve that prevent the blood reflux. The walls of the ventricles and auricles are made up of three layers: epicardium, myocardium and endocardium. The epicardium is the outer layer composed of mesothelium outward and connective tissue inward. Blood vessels and nerves that enter the cardiac muscle run through the epicardium. Many adipose cells are also found in this layer. Myocardium is mostly cardiac muscular cells, intermingled with scarce connective tissue. In ventricles, the myocardium is thicker than in the auricles, and shows an inner and an outer layers. The muscles of the outer layer are arranged in spirals and swirls, whereas the inner wrap around the ventricles and auricles. The endocardium is formed of an endothelium, in contact with the blood, and connective tissue containing some smooth muscle cells. Connective tissue in the endocardium, in contact with the myocardium, contains blood vessels and nerves. The interventricular septum (or ventricular septum) is composed of cardiac muscle lined by endothelium. The interauricular septum (or atrial septum) is thinner and show the same tisular organization and the interventricular septum, although it is a fibrous structure in some parts. Cardiac valves are connective tissue cavered by endothelium. From the inner to the outer part, each valve is made up of three layers: fibrosa, spongiosa and ventricularis. They contain different types of connective tissue: dense, loose and dense, respectively. Main components of the mammalian heart.